The lingering crisis over land that has pitted Itaji and Ayede communities in Oye Local Government Area of Ekiti State has degenerated as another man, said to be from Itaji was found beheaded in the disputed land at Orisumbare. The deceased, still to be identified, was said to have been trailed to his farm in the disputed land and was decapitated, just as his assailants were said to have also severed his hands. The unknown assailants were said to have made away with the severed head of the deceased. The latest killing followed the murder, on the same disputed Orisumbare, of a father of four, Mr. Seti Oladipo, last week, a development which had created tension between Itaji and Ayede communities. 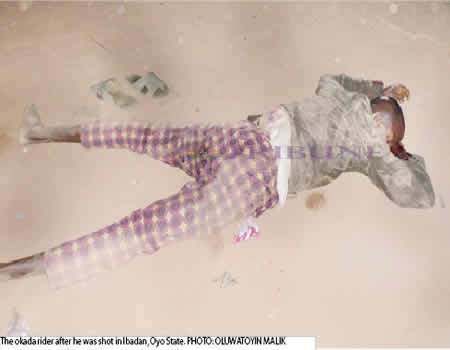 The killing of Oladipo had led to a street protest by the youth of Ayede. The Asiwaju of Orisunmibare, Chief Segun Akanbi, was also said it have been inflicted with machete wounds allegedly by suspected Ayede youths, who had alleged that the Asiwaju fired the shot that killed Oladipo. The lingering crisis has led to a serious tension in both communities, and a fear of outbreak of possible full blown communal clash between the communities. Speaking on the killing, the Onitaji of Itaji, Oba Idowu Adamo Babalola, claimed that the perpetrators of the attack were from Ayede, and alleged that they were now launching sporadic attacks on Orisunmibare in a bid to take over the land. Oba Babalola, who spoke on the telephone, described the killing as “unfortunate” and called on the warring people to embrace peace. The monarch said: “Orisunmibare is a settlement under Itaji and is more than 10 kilometers from Ayede. Ayede people just went there one morning on rampage and the scuffle led to the death of somebody from Ayede. “But yesterday, an Orisunmibare subject was killed inside his farm and he was beheaded. The Asiwaju of Orisunmibare was macheted and beaten to coma and was declared dead by Ayede youths. “The Ayede people were singing that they had killed Asiwaju Orisunmibare but he has been taken to the hospital where he is still under observation. But we have been experiencing sporadic attacks from Ayede people and they have been threatening our peace since then. Police spokesman Alberto Adeyemi, who confirmed the beheading to newsmen, said investigation was still continuing. On the identity of the victim, Adeyemi said it would be revealed after he might have received a formal report from the Divisional Police Officer in charge of the area.